Tokkuri - or Japanese sake decanters - come in an endless variation of designs. A white, Japanese speaking foreigner in Japan is a strange being - especially if he throws a sake flask on a potter's wheel on stage. 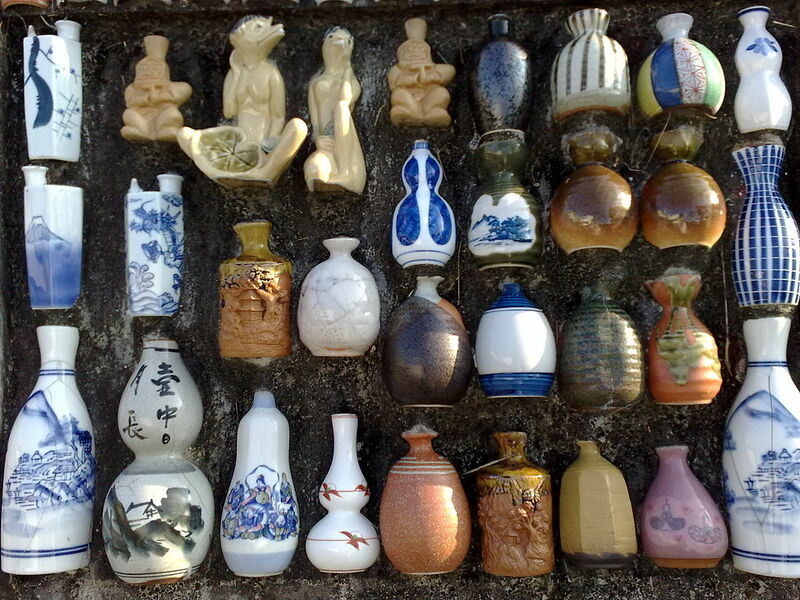 The word tokkuri typically refers to a sake bottle with a slim neck, commonly made from ceramics. ​It was a hot October day in Tajimi, Japan, and I had ended up with the last remaining seat at the event in front of the station. We had come here to film pottery maestro Hidetaki Ando, a man who sell his wares for thousands of dollars, but also is the most charming person you can imagine. The way he speaks the local dialect - tono-ben - is a big part of it, an irresistible charm so totally absent from standard Japanese. There were a lot of people attending the show. My seat, one of the few remaining, bathed in the blazing afternoon sun, and I quickly began to consider escaping to somewhere more comfortable in the shade. "Don't move from there!" My wife gave me a stern look when I began to rise. "This is the only angle from where you can film Ando-sensei without obstruction. You stay where you are!" My Japanese wife is diminutive with regards to her bodily frame, but can halt a charging bull with one of those looks. I sat down again and wiped the sweat from my forehead. I wished I had brought a towel. Then I pulled out my mobile phone and started filming Ando-sensei, as the master started to shape a clump of play into an elegant vase. It looked so wonderfully simple. I remembered how miserably I have failed in my first attempt at throwing a bowl. It was at a friend's pottery studio here in Tajimi, and we had all burst out in laughter as my bowl started to wobble on the wheel and collapse into a mess. You need to keep your fingers wet to avoid friction, otherwise the clay begins to wobble under your fingertips, and the more you try to stop the thing dancing on the wheel the worse it gets. I am terrible with anything requiring fine motoric ability. Always drop things and spill water glasses. Sometimes I even suspect I have some motoric disability. Having tried the potter's wheel once I knew I was a hopeless student of this ancient craft. It was better left to others. "When Ando-sensei invites people to try, you are going to raise your hand, darling," said my wife. And I knew I would. I wiped some more sweat off my forehead. I wished I had brought a handkerchief. Who would have expected this kind of heat in late October? No wonder this was the only empty seat in front row. I was baking in the sun, while the rest of the audience sat in the shade under the ceiling that covered everyone except me. "Who wants to try making something? The maestro will help you out, don't worry!" I felt my wife pulling at my arm. "Your turn now," she whispered in my ear. I felt something strong and powerful rising inside me. A resistance. I turned my head and looked back at the crowd. Not a single foreigner there. Here I was, a big, white, overweight and bald polar bear about to dance on stage. 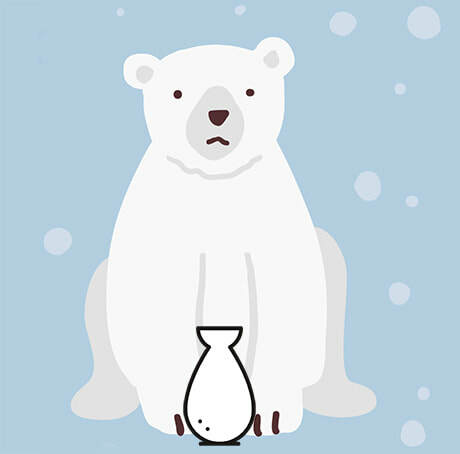 I wondered if there actually are bald polar bears. It didn't matter, that's how I felt. To my relief an elderly lady rose her hand, and maestro Ando invited her to take a seat by his side. By the time the lady was finished the announcer had had me in his cross-hairs for quite some time. No escape this time. My wife pulled at my arm again, and I raised it before he even had a chance to address me. In my mind I shrank to a very small, embarrassed, and resigned little man, so very different from the bulky guy that now stepped forward to take a seat by the side of the Maestro. For my mind's eye I saw that wobbly piece of clay spinning out of control. So I decided to try to make something impossible. A tokkuri. 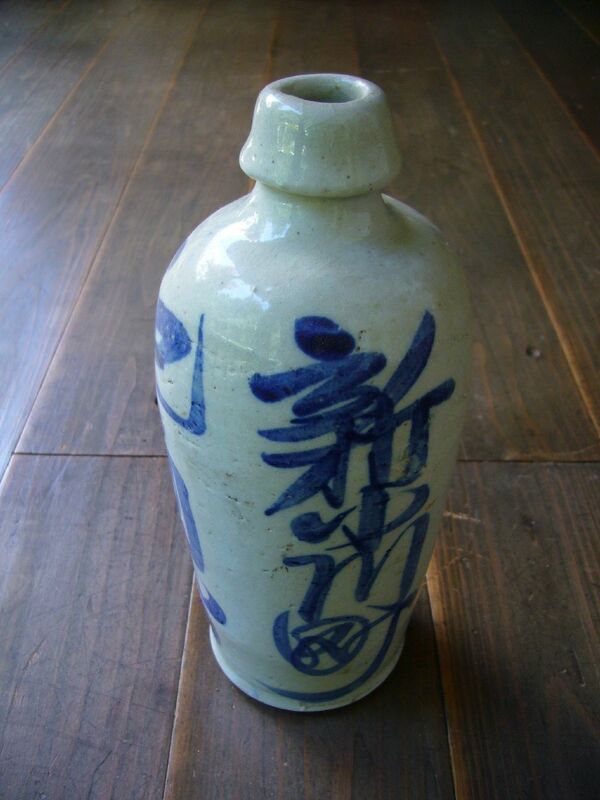 The proper English name is sake flask or decanter. That's much harder than a simple bowl, since it has a neck and a mouth. Surely I would ruin the thing half way through, but it felt cowardly to try something plain and simple, like a bowl. Everybody can throw a bowl after a couple of tries, they say. Except me. My fear of failure in front of an audience is an old curse of mine. I still dream about coming to German class and discovering that I have forgot to do the homework. Our high-school German teacher in my hometown in Sweden was quite an old dragon, a cello-playing perfectionist who wouldn't tolerate people skipping their homework. Every week there was an oral test, and she would pick one student and commence a tortuous test that seemed to last foreve. I still have nightmares where I come to class and is picked for the test, not having a clue how this week's verbs should be inflected. But there is more to this story than my old fear of failure. To be a foreigner in Japan is something very different from Europe or the US, where you have to be truly odd looking to stand out. Places like New York or London are melting pots, where you will see millions of people from all corners of the world. Japan is different. There was a time when I would step into a café in Tokyo and the waitresses would look at me in bewilderment. I remember one time when they all ended up in a corner, pushing each other, arguing about who should take the order. "I don't speak a word of English, you do it!" they quarreled. It was quite an embarrassment sitting there at the table, waiting for them to sort out the problem. On the countryside of Japan, foreigners are still a rarity - especially Caucasians. In Tajimi I rarely see other white people. Chinese are a common sight in certain areas, and easy to spot on their old, second hand bikes when they go shopping in groups. They and other Asians come to work in Japan and save up money. More and more unskilled workers are allowed to enter the country temporarily, as companies struggle to fill positions because of a shrinking population and the unwillingness of young people to work in manufacturing - like in the small factories in Tajimi. I, on the other hand, am a rare sight here with my blond hair and Scandinavian look. So far I have only met one person from the Nordic countries in Tajimi (a Finnish girl), and only a handful of other Caucasians. That's why I felt like a polar bear when I stepped forward to join maestro Ando on stage. The announcer asked me where I came from, and when I answered in Japanese he seemed amazed. Japan is still at a stage where foreign people who can speak the native language fluently are noteworthy, and people who are fluent in the written language as well are a sensation. It's really hard to get to that level. Here in Tajimi I may be the only foreigner approaching fluency both in spoken and written Japanese. I fired off a quick response to the greeting, and the audience reacted immediately. The show was on. I have added English subtitles to the video, so hopefully you have a good idea of what happened next. (If you couldn't see the subtitles, make sure they are switched on. Turn them on by clicking on the little "cc" button at the bottom right corner of the screen. On mobile, tap the screen to see the icon, or the three little dots that open the captions menu). I look quite happy and jovial in the video. I was, in fact. Maybe it was Ando-sensei's charming dialect and friendliness, maybe it was just the fact that the tokkuri behaved itself. When I got to the hard part I started a little chat with the announcer about the Swedish pottery town of Gustavsberg, and forgot the thing on the wheel. Ando-sensei took over and before I knew it there was only a little touch-up work left. I folded down the edge of the mouth a bit so that it will be easier to pour the sake. Afterwards I was asked to choose between three kinds of glazes, and I picked a pink Shino glaze. I hadn't messed up things after all! Did I just produce a real Shino style tokkuri? It had all happened in a matter of minutes! I imagined myself serving someone sake with my nice, partly-made-by-my-very-self decanter. Wouldn't that be pleasant? If my old German teacher is still alive, she would be a great first guest, indeed. True, had I made the thing myself it would surely have ended up warped in all sorts of ways. I would surely fail if I attempted to fire it myself, that is better left to Ando-sensei. I though of the terrible heat the little decanter must endure in the kiln. I guess Ando-sensei is not going to fire it in his old-style noborigama, but in a modern gas kiln. I read he uses that for the inexpensive goods he makes. Even so, after all the writing and thinking I have done about pottery since starting this site, the little tokkuri has found a special place in my heart. It is not such a bad idea after all to try out pottery in one of the many workshops around here. A bit of quick work and a few stains of clay on your trousers is all it takes to make something that could last for centuries. I would never have though so, but my little trial have finally turned me into a pottery fan. To get an idea of how Ando-sensei works and the things he makes, you can view this program, that starts with a scene showing him working at his kiln firing Shino ware. 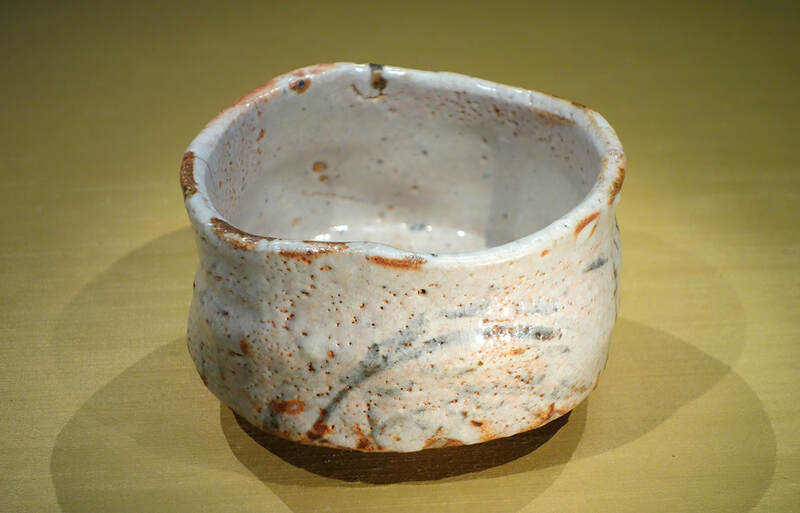 He put glaze (yuyaku in Japanese) on the wares by dipping them into the liquid. At one point he smashes fired goods that he finds faulty. Shards from ancient, smashed Shino ware that were found in the mountains of Kani city near Tajimi is regarded as evidence that the area is the origin of this fine brand of pottery. The Swedish Gustavsberg Porcelain town is mentioned in the story. You can take a VR tour here.